Cindy Goff and Michael Muir are following the route taken by John Muir in his first great wilderness adventure, The Thousand Mile Walk to the Gulf. Starting in Louisville, Kentucky the Journey goes through Tennessee, North Carolina, Georgia and Florida to arrive at Cedar Keys on the Gulf of Mexico in December. In an effort to support our equestrian "cousins" in the wagon and carriage driving world, The Long Riders' Guild is hereby publishing information for the first time about a wagon expedition of historic importance. This "wheeled" journey is being done in the footsteps of America's most famous naturalist, John Muir - by the great grandson of the man who helped formulate the Sierra Club and lay the groundwork for America's preservation of its natural beauties. Michael Muir is a dedicated horseman, who has bred his own line of Stonewall Sporthorses for many years. He is driving Stonewall Domino for this great Horse Journey. Mike was diagnosed with Multiple Sclerosis at the age of 15. He is a passionate believer in what people with disabilities can achieve. He uses Horse Journeys to show by example that disability does not mean inability. Also on this extended expedition will be Cindy Goff, who was paralysed in a riding accident more than twenty years ago. Cindy is a wheelchair user working for the Cardinal Hill Rehabilitation hospital in Lexington, Kentucky. She shows wheelchair patients how to adapt to active living. 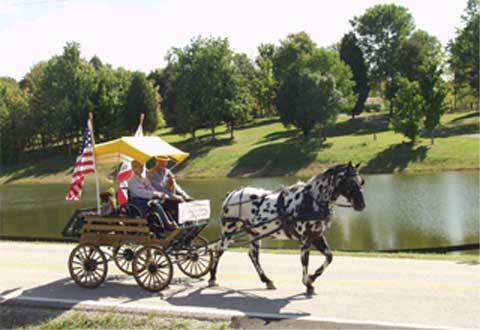 Both Mike and Cindy have represented the USA in Carriage Driving competitions for the disabled. Mike is shortly to retire from his post as President of United States Driving for the Disabled, Inc. The exceptional trip being done by Michael, Cindy, and Stonewall Domino is a magnificent example of individual courage in the face of adversity, something all Long Riders understand very well. Though Michael and Cindy are using wheels, instead of hooves, The Long Riders' Guild is proud to support both these extraordinary travelers, as well as others like them. Michael and Cindy are proof positive that courage comes in all shapes and sizes. This photograph shows Stonewall Domino and Count Pompeii getting acquainted when Cindy and Michael passed through Kentucky in early October. Michael has already made one incredible wagon journey! 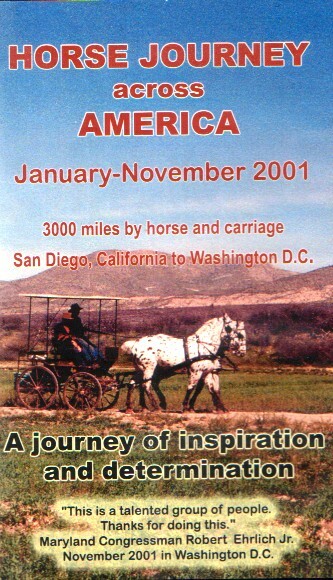 From January to November 2001 he, Gerry Teasley and Long Rider Jose Hernandez, travelled from San Diego, California to Washington, DC. The video on the left has been produced by United States Driving for the Disabled. For details of how to order a copy, please click here.